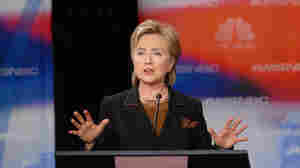 October 28, 2011  The presidential candidate personally responds to a call for her to drop out, accusing Rick Perry's campaign of a "stealth attack." 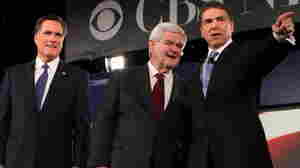 October 17, 2011  Texas Gov. Rick Perry entered the GOP presidential race Aug. 13, and went on to raise $17.2 million in the remaining 49 days of the quarter. These fat numbers put Perry at the front of the GOP money race. But when we dissected Perry's FEC report, we found three hidden weaknesses. HANOVER, NH - OCTOBER 11: (L-R) Jon Huntsman, U.S. Rep. Michele Bachmann (R-MN), Texas Gov. 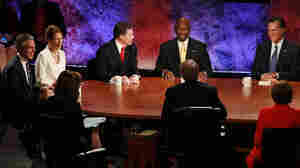 Rick Perry, Herman Cain and Mitt Romney laugh during the Republican Presidential debate hosted by Bloomberg and the Washington Post on October 11, 2011 at Dartmouth College in Hanover, New Hampshire. 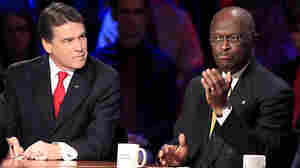 October 17, 2011  This week's Political Junkie column focuses on the state of the Republican presidential field, and why the current fixation on Herman Cain is not likely to last. Former Massachusetts Gov. 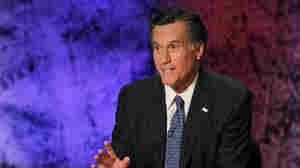 Mitt Romney maintained his frontrunner status in the GOP presidential debate at Dartmouth College on Tuesday. October 12, 2011  Mitt Romney continued his dogged, incremental pursuit of the White House on Tuesday night, dominating the GOP presidential debate on the economy. 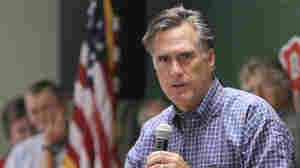 The man once touted as his most formidable opponent was barely a factor. 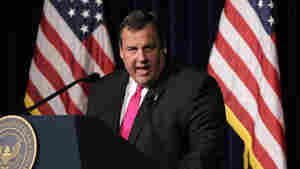 If he decides to enter the GOP presidential race, New Jersey Gov. Chris Christie could learn a few things from fellow Gov. 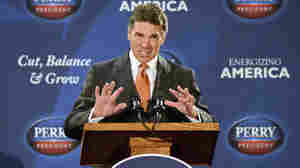 Rick Perry's troubles on the campaign trail. 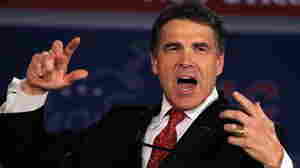 October 3, 2011  Rick Perry's troubles hold good news and bad news for Chris Christie. Good news in that Perry has failed to capture the imagination of the base, and bad news that the intense scrutiny of a presidential campaign can unnerve even a confident campaigner who was wooed to enter. 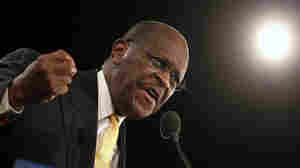 September 26, 2011  Herman Cain won Saturday's straw poll at the Florida Republican convention in Orlando. 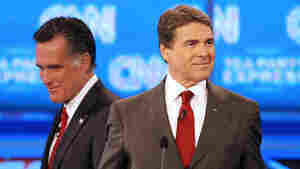 The bigger news was that Rick Perry, who had been the favorite, finished a weak second. September 13, 2011  Texas Gov. Rick Perry, the Republican presidential frontrunner, has tried to walk back his more incendiary comments about Social Security, but his opponents aren't about to let voters forget. NPR's Don Gonyea reported earlier on Morning Edition. September 12, 2011  Pawlenty, the former Minnesota governor who dropped out of race following his poor showing in the Ames Straw Poll in Iowa in August, endorsed Romney Monday. The endorsement is getting big play on former Massachusetts governor's campaign website. August 30, 2011  They "got us into this mess and they simply don't know how to get us out," Romney declared, without mentioning his rival for the Republican presidential nomination.